Theirs was an unconventional love story and for their one year together, she received this bouquet of lilies snuggling alongside liatris and eustomas. These perky compositions will surely bring about smiles from passengers as they sit pretty on the Malaysia Airlines counters at the Kuala Lumpur International Airport. The arrangement features gerbera daisies, buttons, statice, caspia and ruscus. 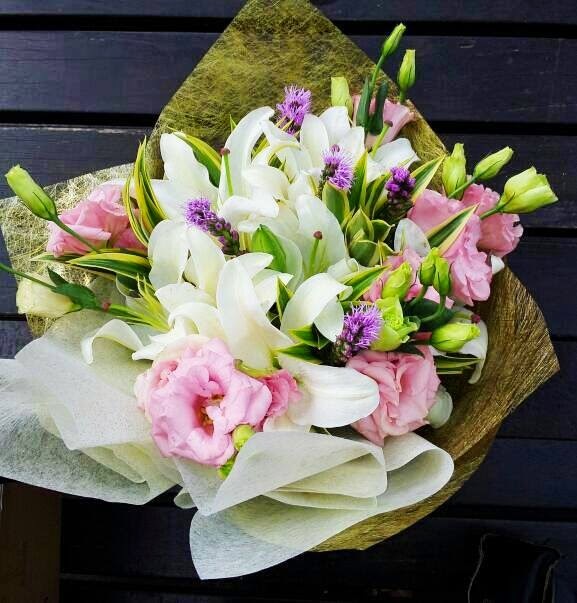 Bouquet with white lilies, purple roses, eustomas and caspia. Vase with a composition of crab claws, sunflowers, cymbidium orchids and salix. Cheerful basket of gerberas, daisies, lilies, kermits and statice. Chris and Magdalen tied the knot at St. Ignatius Church in Kelana Jaya last December (yes ... it sure did take us a while to post this). Here are photos of their wedding in church followed by a reception at the Concorde Hotel Kuala Lumpur. Instead of a traditional basket, we made a sweet little cone filled with rose petals for this wee flower child. How precious is this sight? A photo that makes your heart sigh. Magdalen carries this delicate bouquet of peonies, alstromeria, eustomas and roses. For a fun and flirty twist, candy cane striped ribbon was used on the handle. Congratulations Magdalen and Christopher! Thank you for letting us share in the joy of your wedding. Betty turned 60 recently and her wonderful family gathered to celebrate her with a sumptuous meal and lots of love all around. The event was held at Imperial Garden restaurant which has a rich, chinois-themed colour scheme and ambiance. The brief was to create a rich look with jade coloured leaves, willows, vine balls and orchids, which would complement the look of the restaurant. Received a happy text from AS (Betty's niece who organised the event) to say that the birthday girl was delighted with the set up and her bouquet of roses, lilies and eustomas. 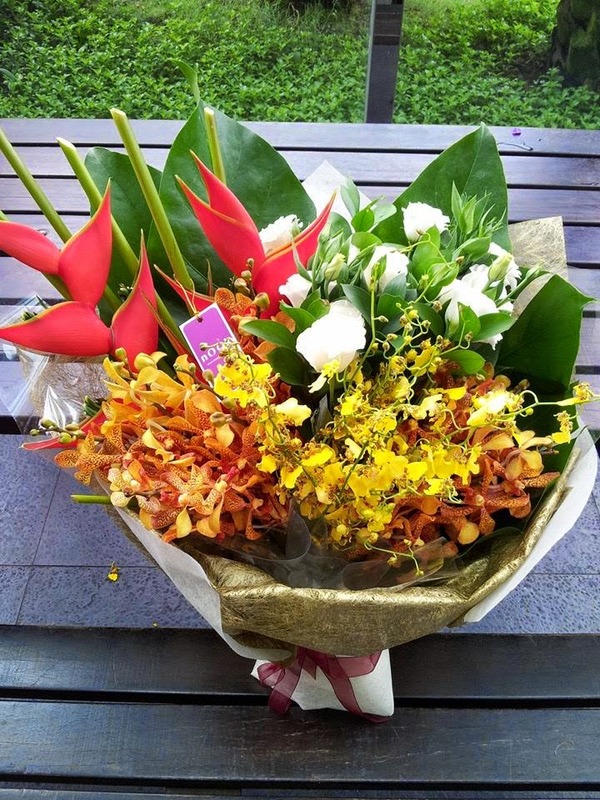 This striking bouquet features the unconventional pairing of orange crab claws with eustomas, golden ramsy and mokara orchids. Sent as a birthday gift to a successful lady with discerning taste. Happy New Year to Muslims everywhere. Salam Maal Hijrah.